Zimbabwe Stock Exchange Acting CEO, Martin Matanda speaking at the launch of the ZSE website. 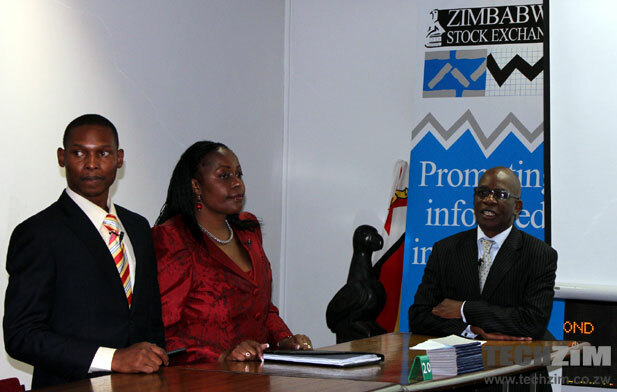 On his right is ZSE Chairperson, Eve Gadzikwa, and a Big Law head of customer services, Albert Nyarugwe. 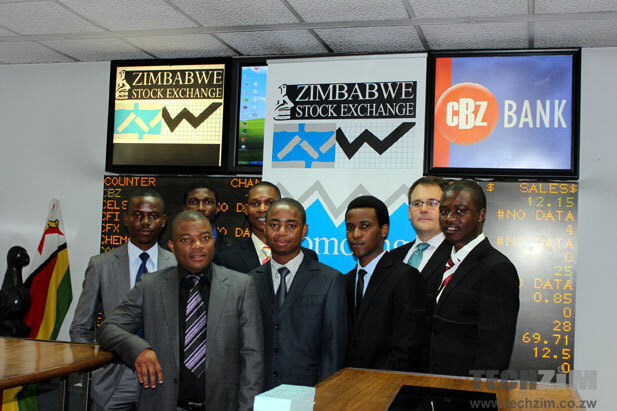 We’re just from a Zimbabwe Stock Exchange (ZSE) event where the local exchange was launching a web portal. The new website comes online after close to 2 years of being down. From our first impressions we almost want to say the wait was worth it, which we shouldn’t say because 2 years is a long long time. But the website is that; really impressive. And its not about design – the design is really good as well by the way – but its about information being available to people that need it. Freely. The website is loaded with lots of useful information that makes it so easy to track what’s going on in terms of the financials of listed companies. You can drill down on each company and get more details like it’s annual reports, graphs of its movement over a period, latest news on the counter, information on shares issued, the company’s executives, other companies related to it, and lots of other stuff. All the information is available free to anyone. ZSE executives speaking at the launch today said making all this information freely available is unprecedented on the continent as other bourses charge for the detailed information on listed companies. There’s also new social media integration. The ZSE’s Twitter account is active right now with over 1,200 tweets made already. Speaking at today’s launch, ZSE acting CEO Martin Matanda said he believes the role of social media in the ZSE’s new initiative is critical. “Twitter and Facebook are being used to interact with all stakeholders, enabling the ZSE to communicate and receive feedback from anywhere in the world with immediate information dissemination.” he said. He conceded that the ZSE is not approaching this assuming everything will be smooth; “there is no doubt that we are new to this and will learn from it so our disclosure policy is expected to evolve according to our experiences,” he explained. Matanda also indicated that they will have an API for organisations that want to connect to the ZSE’s data store. They will however charge a small fee for such access. One small drawback we noticed is that the website is not mobile friendly, which means it’ll be relatively cumbersome for someone viewing it from a phone or small tablet. It’s still in beta, so maybe an improvement is coming down the load. The website itself was developed by a local web development company called Big Law. They have developed investor relations website for a number of listed companies locally, so you could say they have experience in this kind of thing. It looks like Big Law will be managing the website for ZSE onward. On this Matanda said there will be some training of ZSE staff to enable them to do the website themselves but didn’t say how long this would take. I love the new website, its lively, has all the required information and so on. So believe me when i say I’m not hating when i say these words. If a company does a website on WordPress (a free content management system) and purchase a template for the look and feel and installs a few plugins for some additional functions, can we say they developed the website? From my knowledge of this industry, this is not development, this is just customizing a template on top of WordPress. As for the mobile friendly problem, there are many plugins to use to make a WordPress site mobile friendly, i can suggest a few to them and they are all free. What people develop are not websites. People develop databases which drives the website and this is what is expensive. What did they say about re-inventing the wheel. The era of “coding” endlessly and aimlessly is over. Welcome to the new world that runs on themes and templates! all that matters is the layout and content, whether WP, Joomla, plain html+css+jquery….the real cutomer doesn’t really care! Design is key: If this site looked like those gvt websites, all these nerds will be dissing joomla/wordpress right now. If i am a client paying $40million dollars for website development you think i would be chuffed to hear u templatised my website from a $45 theme? They should make their own themes OG, plugins can come in but create your own stuff. If ZSE paid $1000 for the site then i’d understand the $45 theme idea but surely they paid out of the nose. Umm Beaton please educate yourself on the true power of using WordPress, Joomla etc. Did you know the Mercedese Benz USA website runs on Joomla? But have you ever seen a Mercedes configurator extension in the Joomla extension directiory? No. That is because it was developed and the developers decided to use Joomla as the CMS instead of waisting everybodys time in building a custom CMS when one that served their needs already existed. So please stop this nonsense of saying you can’t be called a developer simply because your blank canvas is infact WordPress or Joomla or Drupal etc. P.S. A configurator is what you use to build your custom car on the net before deciding to purchase or just to check out how you can trick out your dream car. Dude re-use is key to development today… otherwise you may as well just go and develop your website in BINARY! I aplaud the “effort”… they picked a really nice WordPress theme! im sorry, but is this website for the “ZSE” or is it for “BIg Law”??? Scroll to the footer and it says “get in touch” with a logo of BIg Law next to it??? Yes, nice wordpress theme (http://themeforest.net/item/etherna-powerful-and-flexible-wordpress-theme/462474) – kikiki, you could have at least changed the theme name? Besides that, great site. Full of information. I agree, they should not be ashamed, they have actually changed the original theme alot, therefore they have spent quite some dev time working on it. why should they change the theme name? Couldnt have said it better. I don’t get the ignorant fools cussing out the possible use of Joomla/Wordpress on the site! They clearly misunderstand the term CMS. The website probably still has hundreds of hours of custom development and coding but some people seem to think that joomla/wordpress sites only run on the extensions/plugins found in their stores and that nothing custom can be built for them. Using a CMS just cuts down on the cost of developing a content management system that will probably serve the same purpose as joomla/wordpress. Building a CMS from the ground up can be costly and may be far more challenging than using a tried, tested and continuosly evolving CMS….but anyways, I cant tell how many times I’ve said this on TZ and you’ll still find someone adamant in saying that already built CMS’s are evil though they can be infact a powerful tool in the hands of the right developer. I am glad you think progress and delivery, the rest is what idle people worry about. Cool website. Well done! But the domain name could have been better I guess. Young team!!! I hope with the forthcoming demutualisation as well as dematerialisation, the site will cope. Tired of websites that remain the same as day of launch. I love the detail on this site probably one of the best so far in Zim. I however wonder why the hosting is in USA, it takes so long to download a 2mb file locally. Maybe they wanted to guarantee security of the site from hackers??? Excellent job by Big Law, free CMS or not, $45 theme or not, I just hope this excellent example of re-use of net resources does not excuse those who abuse themes by just installing and charging premium rand for it without even caring to understand the business and deliver a solution. SOLUTION key word. Great job for bringing back the site and kudos to the BigLaw chaps. Back to the main business did the ZSE guys hire professional pen testers to test this site. If not the typical site down status is imminent now or at some point. So Mr. Mutanda show us some governance and ownership and fund a security testing of the Web and backend infrastructure.